Alcohol withdrawal symptoms should be managed with appropriate care to insure the individual’s safety and prevent unexpected complications. Alcohol rehab helps in many ways to get the patient through the process and prepare them for a life with sobriety. Alcohol withdrawal symptoms can be mild to moderate unpleasant symptoms of craving more alcohol, anxiety, irritation, tremors, and nausea, but, sometimes, even this is enough to spur the individual into taking a drink. Alcohol, like other drugs, causes a chain of reactions in the brain and central nervous system, affecting every other organ in the body in one way or another. As the body adjusts for the continuous presence of alcohol, it only feels normal when the alcohol is present. Otherwise, vital systems go out of control and work in a hyperactive state, signaling the need for more alcohol. Of course, no one’s experience is the same. Depending on how much alcohol you have become accustomed to and your patterns of use, your physical and psychological health, and how many times you have tried to detox before, these symptoms can become life threatening resulting in seizures, delirium tremons (DTs) or death. The possibility of cumulative effects that might worsen future withdrawals is known as the kindling effect and is quite common among alcoholics. 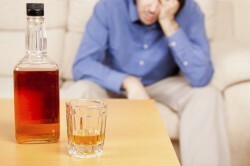 If withdrawal is keeping you from quitting drinking know that there is help available! The first thing rehab helps with is determining underlying factors that can pose complications during your withdrawals. Detox safety is a crucial element of alcohol rehab. Alcohol can damage vital organs including the brain, heart, liver, pancreas, and immune system. Its effects on the central nervous system can play a big role in physical and psychological conditions and the severity of withdrawals. Monitoring the conditions of alcohol withdrawal symptoms is important because alcoholics often have poor health including vitamin deficiencies, dehydration, or electrolyte imbalances that can lead to neurological complications or other illnesses. Interventions and supportive care used in rehab can help the alcoholic complete the process and make the transition to long term treatment by addressing these issues as quickly as possible. Medical and psychiatric professionals can help to prevent the development of serious conditions through various treatment methods including medications to reduce or alleviate cravings, pain, nausea, vomiting, anxiety, insomnia, seizures, and psychiatric disorders.